My niece asked if she could come and make a pavlova. I've made pavlovas twice and both times they suddenly deflated minutes before they were due out of the oven. But, being a person who enjoys challenges and because a reader wrote a couple of weeks ago asking if I've made pavlovas before, I told her I could give it another try. This time the pavlova didn't fall. I think the difference is that I didn't reduce the sugar and I also baked the meringue at a lower temperature of 125 C instead of 140 C. The last two times, the pavlovas were an egg-shell brown before they suddenly fell flat. That was quite a frustrating experience watching two pavlovas fall. Although my third pavlova didn't fall, it was far from being a success. The crust was soft and sticky and the meringue had a ring of clear liquid sugar around it. I didn't know what to do with it so I left it out on my dining table for a whole day and night. The pavlova shrunk a little and the crust crisped up a bit but it was nothing like the crusty pavlovas I've picked up in Australia. I had followed the instructions carefully. My bowl and whisk (borrowed from a friend who doesn't bake; my mixer problem still not solved) were squeaky clean. My egg whites were at room temperature which btw is very warm these days since we are getting into the rice harvest season. I had beaten the whites until they were stiff and shiny. I had put the meringue into the oven at 150 C and turned it down to 125 C less than a minute later. I left the meringue in the oven to cool completely before taking it out. I even baked the meringue for 1 hour 45 minutes, 15 minutes longer than stated in the recipe. Did all that, and the meringue was still soft outside and in, and smelt rather egg-white eggy. If anyone has baked a successful pavlova in this humid weather, please give me some advice. Niece wanted to bring the disaster meringue home so I filled a plastic peanut butter jar with dairy whipping cream and left it in the fridge until she was ready to leave. 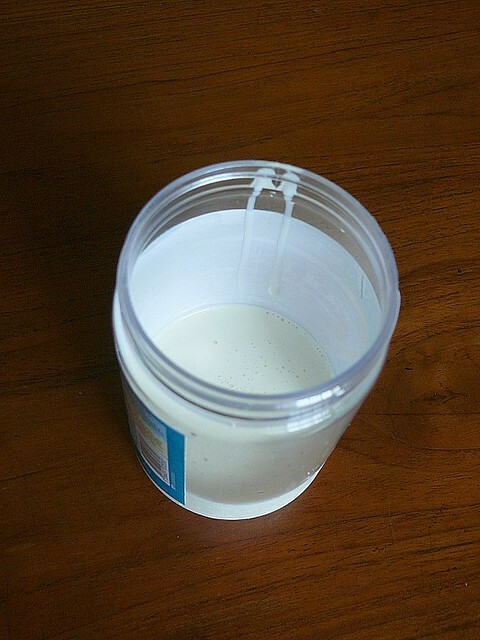 As we walked to her car, I started shaking the jar rapidly to see if it would thicken into whipped cream, like those whipping cream in canisters. After about 30 seconds, there was no more slushy sound from the bottle. So although I have no solution or recipe for a no-fail pavlova, I'm sharing with you a quick, easy way to whip up a small amount of cream. No need to drag out the machine or wash extra utensils. No need for electricity. Next time you have a ladies' tea and you are bringing scones, just put your cream in a plastic bottle (I think air and space are important for the cream to whip up so do not fill more than 1/4 of your bottle), chill it and when ready to use, shake the bottle until there's no slushy sound and there you are, whipped cream ready to use, straight from the jar. The whipped cream will not be as stiff as machine-whipped cream so it's best for non-decorating purposes such as for serving with tarts, pavlovas, trifle and so on. 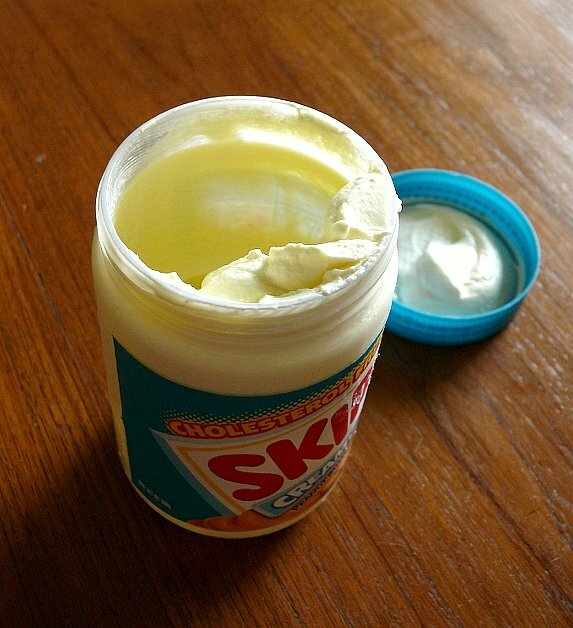 I suppose if you want to be even more resourceful, you can continue shaking the jar and make butter for the bread too. Note: as with cream whipped by machines or otherwise, results are best if the cream is chilled very well. One way to tell is if the slush sound is slow and dull when you shake the carton. A fast, sharp slush that sounds more like milk than cream will not work. I actually put my carton of cream in the freezer for 5 minutes or so, and use the sound test. 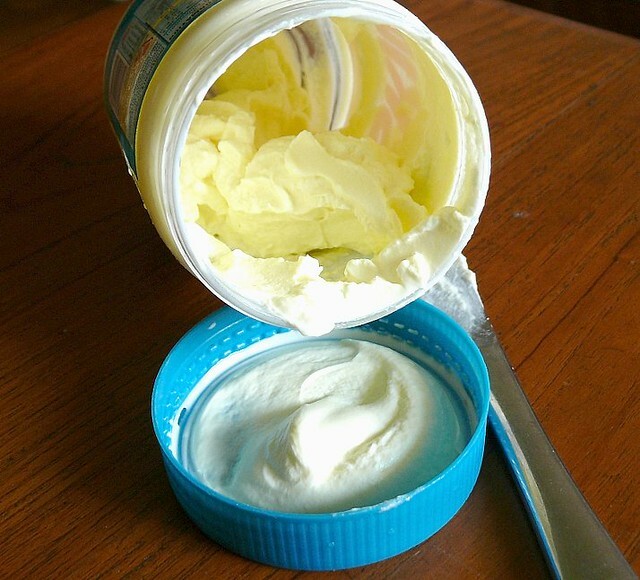 Do not leave cream in the freezer to freeze because it will spearate into solids (fat) and liquid. Thanks for this amazing useful tip! WOW, amazing! Thanks for sharing this great idea. I have not try making Pavlova before, but i did meringue cookie before, and i noticed due to the high humid weather here, the meringue very fast turned sticky once remove from oven. From the past experiences and I learnt that I have to store this meringue cookies immediately into a air-tight container once slightly turn cool. The whip cream tip is almost too good to be true! I really have to try this as a science project for my kids. Thank you SO MUCH!!! this was so useful!! thank you!! I'll try it: very easy and quick!! How are you and how is Yi?? what is your pavlova recipe like? you might want to try mine, which seems to work. I had the same miserable results with the meringue too! Turned out as marshmallow! Gonna give fatboybakes' recipe a try! what brand of whipping cream is it anyway? Thanks for the fabulous tip Terri. For pavlova, I had always used Donna Hay's recipe and they all worked well each time I make them. Unlike FBB, I never need to leave them overnite. Good Luck!